Everyone wants their home to be cozy and secure, and only a few are willing to pay more than absolutely necessary. Wireless control of the devices and technology in our homes will soon be an ordinary part of our everyday lives. However, preferences vary from one family to another, and the home is a personal place that we want to reflect our needs and interests. Cozify aims to bring wireless automation and “smartness” to homes in a way that is sensitive to these more personal aspects. We’re focusing on three main areas: Mood, Security, and Efficiency. So what makes a cozy home atmosphere? It grows from what we see, hear, feel, smell, or taste. We perceive it with all of our instincts. The Cozify team will not focus on kitchen cabinetry or upholstery fabrics - there are other experts in those areas. Instead, our product will, for example, tune the lights including color, temperature, or brightness. Easily. Through use of motion detection and clock- and calendar-awareness, lighting and also sound can be provided when needed to suit the situation. To see how it can work, let’s take a tour through an example scene. Mikko gets off his bus after work and heads home. Walking up the stairs to his door, the kitchen and hallway lighten up to welcome him home. A selection from his music collection starts to play in the background at a moderate volume. Now it is good time to prepare a sandwich. Susanna arrives a bit later with a new ball of wool and sits down in her favorite spot for needlework. With all the gear already on her lap, she needs more light for her activity. She picks up her smart phone and chooses the “Needlework” theme. This immediately brightens up living room, but only the surroundings of her working spot. Soon the couple sits down on couch, one with her needles, the other enjoying his sandwich. It is very early morning, and a taxi is waiting. Helena hurriedly finishes packing her carry-on for a four day work trip as a air hostess to Asia. Then she closes the door and rushes to the parking lot. Stepping into the cab, she catches a glimpse of all the lights in her house turning down, and her smart phone notifies that remote monitoring is turned on. During the evenings while she is away, some of the lights will turn on for a couple of hours, and she’ll be able to check the situation inside the house through a camera. With her mind at peace, Helena turns her thoughts to the flying job ahead. Jonna and Petri have just arrived home with their kids, Julia and Joona. Petri stays outside talking with their neighbor for a while. The conversation turns to heating bills, since it has been a cold winter and they both have electric heating, which tends not to be as efficient when called upon for heavy use. Petri has had some success in controlling costs however, by using his smart home system to define separate temperature levels for each room based on needs at different times of the day. And of course in addition the entire house gets turned down during the longer times while the family is away and the Cozify “Away from home”-theme is active. No one needs to come home to a cold house because of this though, because the “Arriving home” -theme automatically activates on a schedule to prepare to welcome the family with warm rooms. Petri tells his neighbor that so far it looks like they might save up to 15-20% over their costs from the previous winter without the Cozify system installed. 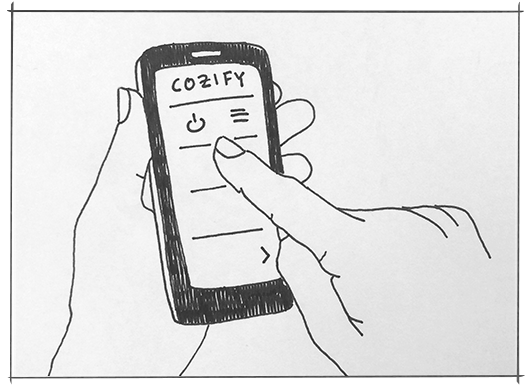 In sum, Cozify wants to nurture the Mood, Safety, and the Efficiency of every home. We are aiming high, so that the threshold for adoption will be low. • What does Mood, Security and Efficiency mean for you? • How would you like your home to work? • Any other ideas or comments on this blog or on home automation in general. Please visit our Facebook pages to comment. We are enthusiastically waiting for your thoughts.